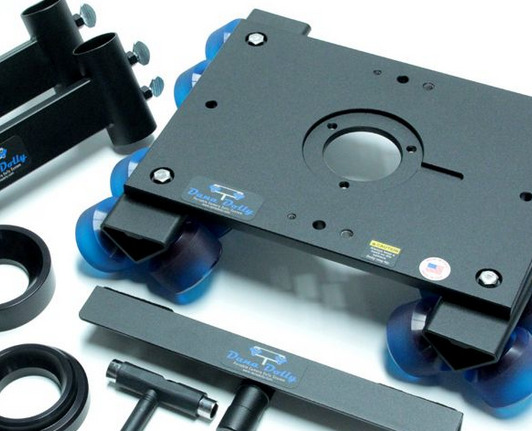 Portable Dana Dolly System and Camera Slider is a DIY Film Dolly. Create beautiful, smooth camera moves in any location. The Dana Dolly is a camera slider and a camera dolly. Best of all it is compact, fast to set up, and easy to use. All you need is 2 pieces of speedrail pipe, preferably aluminum schedule 40 or schedule 80, or dolly track. The pipe becomes the rails that your dolly will ride on. It's so versatile ... you can lay the pipe on the ground, support it on apple boxes, or mount it on combo stands ... what ever you need to get the perfect camera angle. Add one to your rental kit now, buy online for the best price and free shipping at BarnDoor Lighting Outfitters. Camera dollies can really improve your production value, but there are so many options. Do I really need a Doorway Dolly or will a Skateboard Dolly get the job done? Let BarnDoor Lighting help you pick the best dolly or camera slider for your budget. Our Lighting and Grip Experts have the experience and knowledge to answer your questions. Experience the "BarnDoor ... Get More" difference.